Yes, clearly Sarge thought The Thanksgiving Day Turkey was arriving a day early, but upon proper inspection it turned out to be The Notorious Neighborhood Skunk... yet again! Yes, it happened again! Almost two weeks to the day after he got skunked the first time. Just as I was making an apple pie for Thanksgiving, my sister and daughters both said they could smell skunk. My heart sank as I called for Sarge to see if he was in the house...yep, he was outside! We have Invisible Fence, so the skunk is coming into our yard to visit Sarge! There must be some sort of attraction...obviously unfortunately! So Sarge got a special de-skunk spa treatment...again! It actually works quite well. The house doesn't smell at all. It's 500% better then it was the first time when we didn't know what to do and used tomato juice. Sarge is still a little skunky, though. I am hosting Thanksgiving, so I called everyone to make sure they liked a side of skunk with their turkey!! Happy Thanksgiving to you and yours, Linda. Hmmm....side of skunk? Where are you from exactly? Oh, nooooo! Hmmm, I wonder what a side of skunk tastes like?! This will definitely be a Thanksgiving to remember! I must have passed my skunk luck onto you, lol. We had that happen every year, the night before we left for vacation. Oh no! Lightning does strike twice (well, skunks strike twcie anyway!) I'm so sorry but it sounds like you know what you are doing now! piano keys are the perfect finish. Can'k believe you are sewing borders on while preparing for Thanksgiving dinner---and company. Only you could do that. You have a great attitude! Hope the darn thing goes away for good. Sounds horrible! 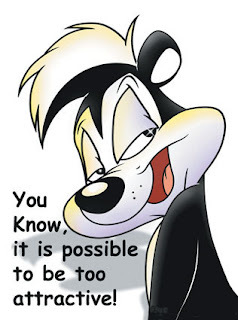 My only experience with skunks is Peppy La Pew(spelling? )from childhood cartooning,no skunks in Australia. Perhaps you need to find a stray black cat and give it a white stripe!! leave the rest to animal attraction!!! Seriously, I don't envy you. This story cracked me up even though I have no idea what a skunk smells like. At least you've found a good spa treatment. Oooh, been there, done that and it never ever happens at a convenient time! Apparently it's true, a dog has no memory of a skunks very rude hello. I've never smelt a skunk - we don't have them in the UK - and I don't ever want to. I love your blog, and your Schnibbles quilts that you've shown are wonderful. UGH! That happened to my friend a few weeks ago. What a nightmare!